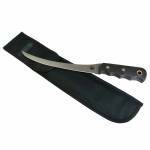 Designed by fishermen for fishermen and ergonomically designed to fit perfectly in your hand, this knife is a game changer. We’ve stayed true to our roots by incorporating the iconic non-slip grip handle so you can keep a firm grasp on the blade while turning your latest catch into your next meal. The engineered ventilation has been designed to maximize motor transmission output giving you an incredible amount of torque. 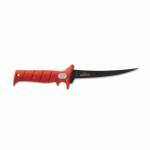 Included are four different blade styles — 7” E-FLEX, 9” E-FLEX, 9” E-STIFF..
Bubba Blade Lucky Lew Folding Knife 5 in. 6" Famous patented Bubba Blade "No-Slip-Grip" handle provides ultimate knife control 5" High carbon, non-stick, titanium bonded, stainless steel blade 1.5" Serrated cutting edge Secure lock-back design Thumb and finger pads for control Safety guards for protection Rockwell hardness rating of 56-58 Black synthetic sheath with belt loop Blade folds completely into 6" handle ..
Bubba Blade's™ Fishing Pliers are designed and built to be the ultimate in control, strength & durability. The pliers feature our patented "No-Slip-Grip" handle just like BUBBA BLADE™ knives, ensuring that this tool will stay firmly anchored in your hand. 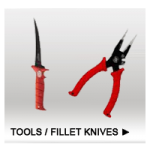 Fishermen have come to rely on our patented red handles for safety and control, and now you can have them on your pliers. 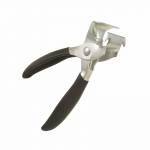 In addition to the handles, these pliers feature a super tough Cobalt cutter and convenient split shot and leader sleeve c..